6 Week Body Composition Challenge! Are you tired of focusing on your weight? Do you work hard on your fitness and still see the same number on the scale? 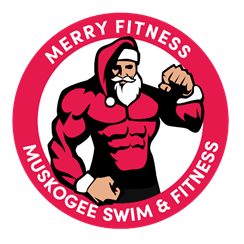 – Register at Muskogee Swim & Fitness Center. – Gather a team of 3-5 participants. – Choose a team name and Captain. – Team Members check-in before Sunday, November 18th between 6:00am and 7:00pm to get your initial Fitness Evaluation. This process could take about an hour so it would help to call ahead. “Merriest Fitness” Grand Prize for the team with the highest change in fitness level. based on the highest change in fitness level. “Most Spirited” Team who gathers the most points throughout the 6-week challenge. Questions? Call Muskogee Swim & Fitness Center at 918)684-6304. Teams will complete an initial fitness evaluation the week before Thanksgiving (no later than November 16th) and complete a final fitness evaluation beginning December 31st-January 4th. This six week challenge will test your will power and determination to achieve the ultimate goal of NOT GAINING WEIGHT OVER THE HOLIDAYS and IMPROVING YOUR OVERALL FITNESS LEVEL! Accountability is the key to success! How to Participate: Gather a team of 3-5 participants (age 16 and older). Choose a team name (e.g. Pound Packers, Calorie Crunchers, Choose to Lose, Flab Fighters). Designate a “Team Captain”. Fill out the registration form and schedule your fitness evaluations no later than Friday, November 16th at Muskogee Swim & Fitness Center. Program details: The competition begins the day your team completes the initial fitness evaluation. Team captains will lead their team in a 6-week “Fitness Challenge” to increase physical activity, eat healthier, and increase your overall fitness level. Teams will be measured as a group using fitness evaluations conducted on each team member. Teams compete for great prizes and everyone has a chance to come out on top as winner! Who can participate: Anyone age 16 and older. You do not have to be a MS&FC member to participate. Sponsorship deadline is Wednesday, November 23rd to make it onto our team t-shirts. For more information or event details please contact MSFC at (918) 684-6304. You can also support this event by donating promotional items, prizes, coupons, brochures, etc. for participant packets (we expect to make an average of 50 packets). Please submit packet items by Friday, November 16th. Thank you – your support is appreciated! Sponsorship includes your company name on the event shirt and one event t-shirt. Sponsor a team of 3-5 of your friends, family, or employees. Each participant will receive one event shirt.